Pull up a chair and set a spell. We’ve been invited into the Mount Vernon, NY, home of black centenarian sisters Sadie and Bessie Delany, and we are about to be entertained, engaged and enthralled by the wit, wisdom and joie de vivre of these inseparable spinsters. The year is 1993. Sadie is 103 years old, and Bessie is 101. The second and third of ten siblings born to an education-loving former slave, the Delany sisters are a far cry from stereotypical. Both college graduates, Sadie, with a Master’s Degree in education, has distinguished herself as a teacher in New York City’s schools, and Bessie, a Columbia University Dental School graduate, was the second black woman to become a licensed dentist in New York State. 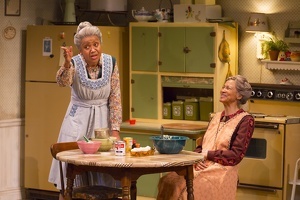 The sisters’ tales of family are interwoven with American history, in particular as it impacted their lives and the lives of black families in what was a century of struggle — racial segregation in the Jim Crow era, prejudice, the Civil Rights movement, the stock market crash, the Great Depression, two world wars, Rosa Parks, Montgomery and Dr. Martin Luther King, Jr.
Having lived so long together, the sisters complement each other seamlessly, often speaking in unison. However, they are far from carbon copies. Olivia Cole is soft-spoken Sadie. She is the quiet, gracious one, seeking peaceful resolution in times of conflict, whereas Brenda Pressley’s Bessie is outspoken and opinionated, spunky and feisty. She doesn’t hesitate to express her true feelings, and her one-liners generate much laughter. Their warmhearted give-and-take reflects their singular bond. Under the masterful direction of Jade King Carroll, Cole and Pressley don’t miss a beat as they move about the set, even prepare an elaborate meal to celebrate their deceased father’s birthday. From the outset, they shift gears casually as the memories tumble forth and Delany family photos are projected above the back wall. It’s no exaggeration to say that Alexis Distler’s set is a third “grandmotherly” character. The sisters’ Mount Vernon home is an inviting three-room single set with a charm and history of its own.